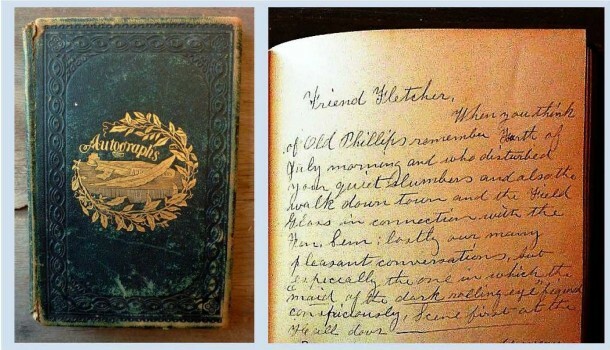 When the youngest son of pioneer leader Calvin Fletcher graduated from Phillips Academy in 1865, he asked his classmates to sign an autograph book. Greener would later go on to become the first African-American to graduate from Harvard University and the dean of the Howard University School of Law. But despite Greener’s optimistic inscription, Albert Fletcher never made it to Harvard, at least not as a full-time student. After repeatedly failing the mathematics portion of Harvard’s entrance exam, Albert enrolled in nearby Brown University and took an occasional class at Harvard. During breaks from school, he worked part-time at the bank established by his father and Thomas Sharpe, his future father-in-law. Albert’s older brother, Ingram, was already installed there, learning the ropes of the banking business under his father’s careful tutelage. Then in 1868, Albert quit his studies and returned to Indianapolis to marry Eliza Sharpe and join his brother and Thomas Sharpe in running the Fletcher & Sharpe bank. 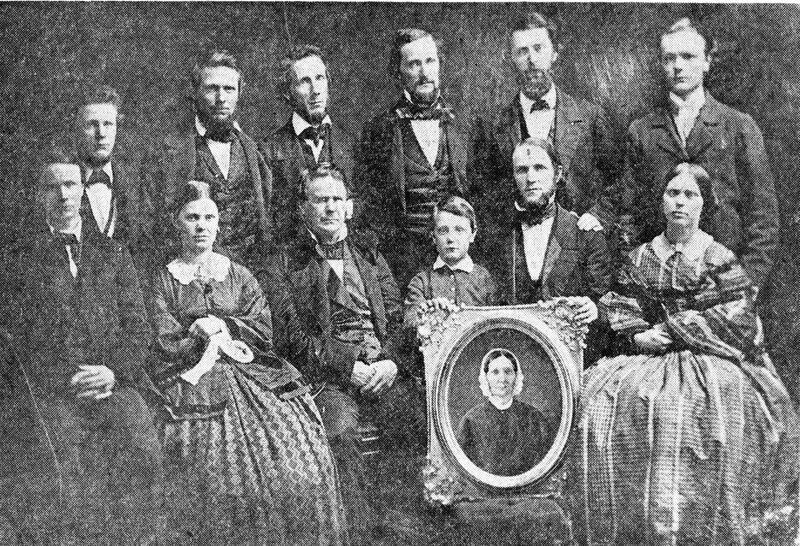 The Fletcher family posed for this portrait around 1855. Ingram is seated in the front row on the far left. Albert is the young child sitting next to his father, Calvin Fletcher, and clutching a portrait of his deceased mother, Sarah Hill Fletcher. After Calvin Fletcher fell off a horse and died in 1866, Ingram Fletcher and Thomas Sharpe continued operating the bank. Albert joined the partnership in 1868. Albert Fletcher’s home at 1121 North Pennsylvania. Photograph courtesy of Indiana Landmarks, Wilbur Peat collection. 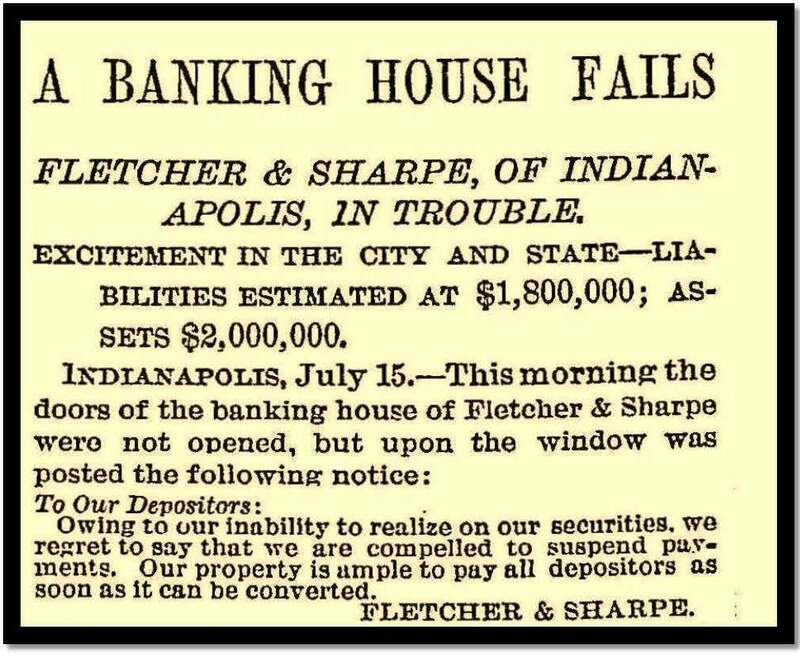 Although Indianapolis was struggling with a financial depression in the 1870s, business was booming at the Fletcher & Sharpe bank. Albert and Eliza built an elegant Italianate Renaissance home on North Pennsylvania that boasted 14-foot-high double entrance doors, marble floors, extravagantly carved woodwork and bronze carvings. 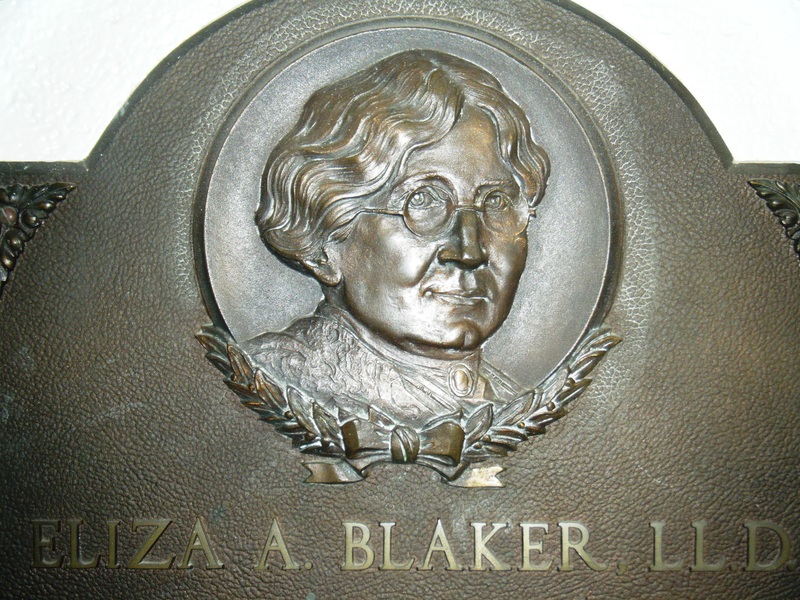 Life in Indianapolis was great for Albert and Eliza Fletcher. Until it wasn’t. The sudden closure of one of the city’s oldest financial institutions hit “like a thunder-bolt from the clear sky,” according to historian Jacob Piatt Dunn. The Indianapolis News reported that the “hermetically sealed” doors of the bank were quickly besieged by an anxious throng, with the loudest wailing coming from small investors, especially those who were women. 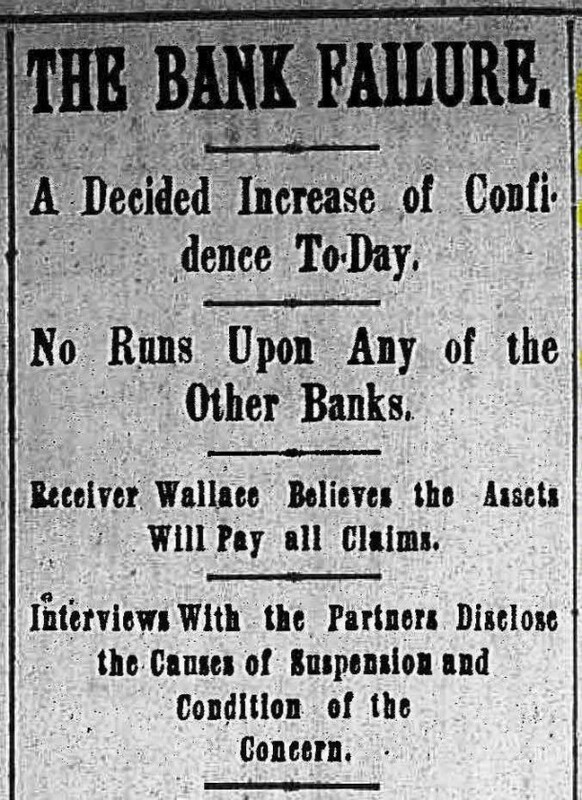 This was because Fletcher & Sharpe’s bank was favored by average citizens, many of whom had entrusted their entire life savings to the bank. 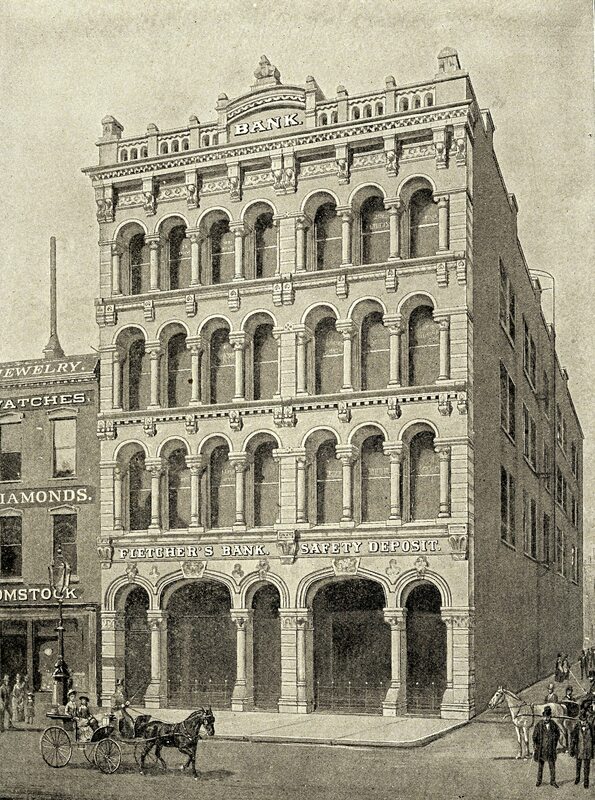 The Fletcher & Sharpe bank building on the southwest corner of Washington and Pennsylvania Street. After the bank’s demise, the building housed the Model Clothing Company. 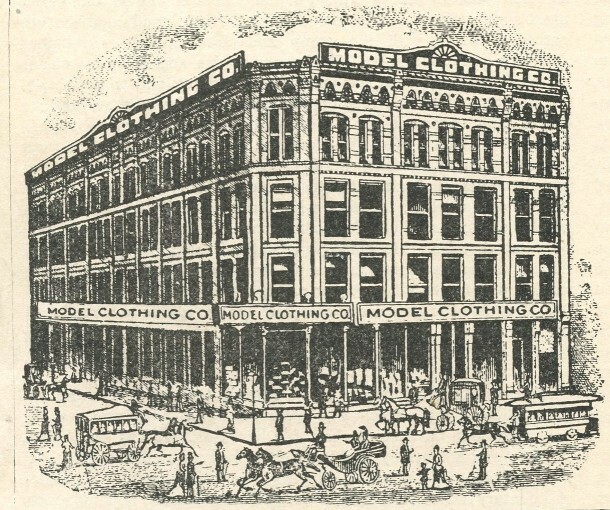 As the bankruptcy estate was settled, the Fletcher brothers’ homes, artwork, and opulent bank building on the southwest corner of Washington and Pennsylvania Streets were all sold. However, even with the addition of the Fletchers’ personal assets, the bank was still $600,000 in the hole – a considerable amount in the 1880s. Ultimately, the bank’s depositors received only 80 cents on the dollar, with more than half of that amount paid by Stoughton A. Fletcher, who operated his own successful bank but had agreed to join his brothers’ firm as an accommodation. The Indianapolis News, July 16, 1884. Ingram Fletcher told the News that the Fletcher & Sharpe bank could have been saved from ruin if he and his brother had been more aggressive in collecting on the debts owed to the bank by some of the city’s most prominent businessman. “We might have taken them by the throat and choked the life out of them, but in so doing we would have ruined many hard working, struggling and honest businessmen. We hadn’t the heart to do it,” Ingram said. 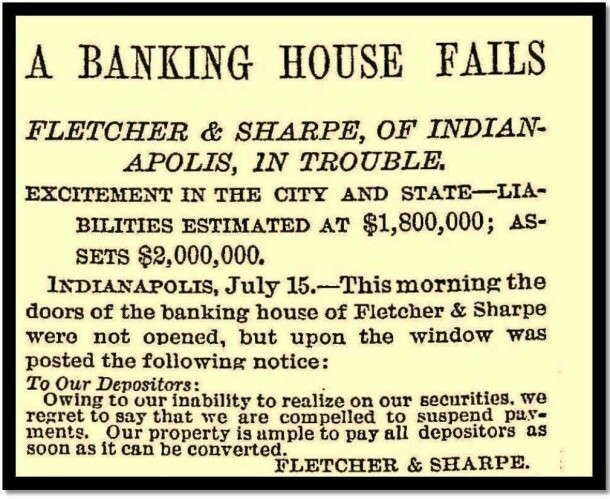 Despite the honorable manner in which the Fletcher brothers handled the bank’s demise, Albert and Ingram realized that their reputation was irrevocably tarnished and that they would never again engage in the banking business in Indianapolis. As a young man, Stoughton had learned the banking trade in a bank owned by his uncle, also named Stoughton Fletcher. The elder Fletcher’s bank proved to be the longest lasting of the Fletcher banks, merging with other financial institutions until it became American Fletcher National Bank (AFNB) in 1954. The Fletcher name finally disappeared from the Indianapolis financial scene in 1987, when AFNB was purchased by Bank One (now Chase). Albert took a job as a traveling salesman for the Pneumatic Company, and he and Eliza moved to a smaller house on Pennsylvania Street. Around 1890, the family relocated to Philadelphia, and then to Farmington, Connecticut. After a subsequent move to California to venture in real estate proved disastrous, Albert and Eliza returned to Farmington, where Albert died in 1918. Ingram moved his family to Orlando, Florida to be near his wife’s parents. There, he operated a bookstore and engaged in insurance and real estate. In 1891, President Benjamin Harrison commissioned him as Orlando’s postmaster. He later became the first cashier of the State Bank of Orlando. Ingram died in 1903. Albert Fletcher’s mansion remained a private residence until the mid-20th century, when it was converted into an elegant restaurant and nightclub. 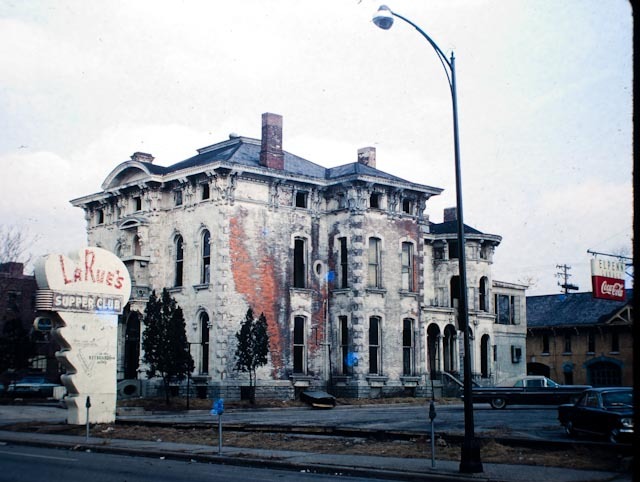 LaRue’s Supper Club was one of the city’s finest dining establishments until it was demolished in the 1960s to make way for construction of the interstate. Now nearly 150 years old, Albert’s boyhood autograph book surfaced in California last month, where a seller offered it on ebay. 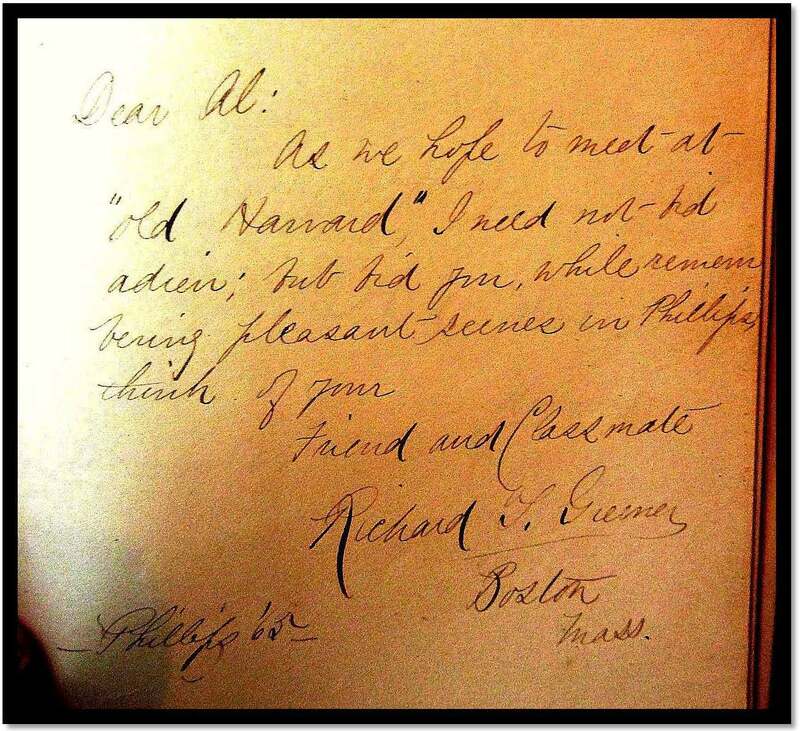 Thanks to the inscription by Richard Greener, the book fetched $109. In 2009, a contractor demolishing an abandoned house on the south side of Chicago discovered an old steamer trunk that contained Greener’s 1870 Harvard diploma — water-damaged but intact — his law license, photos and other papers connected to Greener’s remarkable life. Rufus McDonald sold the diploma and law license to the University of South Carolina for $52,000. But when Harvard balked at his asking price for the remainder of the treasure trove in late 2013, the contractor threatened to “roast and burn” the documents. Within a few days, McDonald’s temper had cooled, and he acknowledged that the threat was simply a stunt aimed at getting Harvard’s attention. “They tried to push me to the side like a dirty old dishrag,” McDonald told the Chicago Sun-Times. At last reporting, McDonald was hoping to sell the Greener archive to “a wealthy black Harvard alumni,” rather than the university itself. Albert Fletcher’s 1865 autograph book was inscribed by 45 of his classmates and instructors at Phillips Academy in Andover, Massachusetts. The colorful note pictured above is from Augustus Steinfield. I recently got a picture on ebay of a Emma Fletcher Mercer from a Indianapolis photographer from 1880 to 1890. I thought it might be one of Calvin’s relatives and no one was bidding on it. I hated to see it lost so plan to give it to the Historical Society on for the collection of photos. I would post it here but don’t see how I can add it. Does this name fit into the Fletcher family? Libby, that was a wonderful article! There is so very much that I do not know about my hometown and enjoy reading about it as I sit at my computer here in Las Vegas! Thanks so much. When I was 13 or 14 years old around 1955 or so my Aunt Kit took me to dinner at LaRue’s. I believe she knew the owners. What I obviously do NOT remember is the accurate name of an offspring of S. Fletcher (I think) who brought his favorite racing horses into the living room to show them off and a vague recollection of l (perhaps 2, perhaps mother-daughter) strange deaths-suicide? I remember sitting in that opulent mansion and reeling as Dr. London told house history. I am not sure if HL still active, I did catch up with him after his return to NYC–he incidentally gifted the most remarkable musical archive of Hoosiers Albert,Harry Von Tilzer to IHS via our short-lived Musical Heritage Committee–sad that IHS doesn’t exhibit probably the most outstanding archive of American sheet music and publishing. Hi Louie Mahern—Re LaRue’s—that was probably me you saw sitting in the cocktail lounge (for a period in Indiana women could not sit at a bar) listening to the glistening ebony automatic grand piano ( a first in Indy.) And, of course your aunt knew the owner. There was hardly anyone in that era who did NOT know Harley Horton–builder, entrepreneur, man about town, (and man of mystery in one facet of his life.) 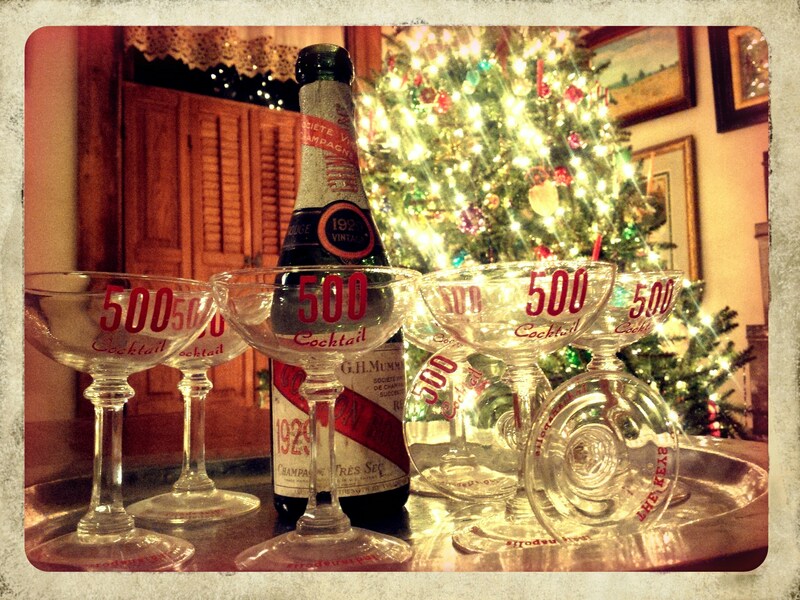 who turned the mansion into an awesomely elegant night club with live entertainment such as Jack Teegarden, Louis Armstrong, every big name of the era. His elegant Broad Ripple mansion became what is today F & Buchanan. 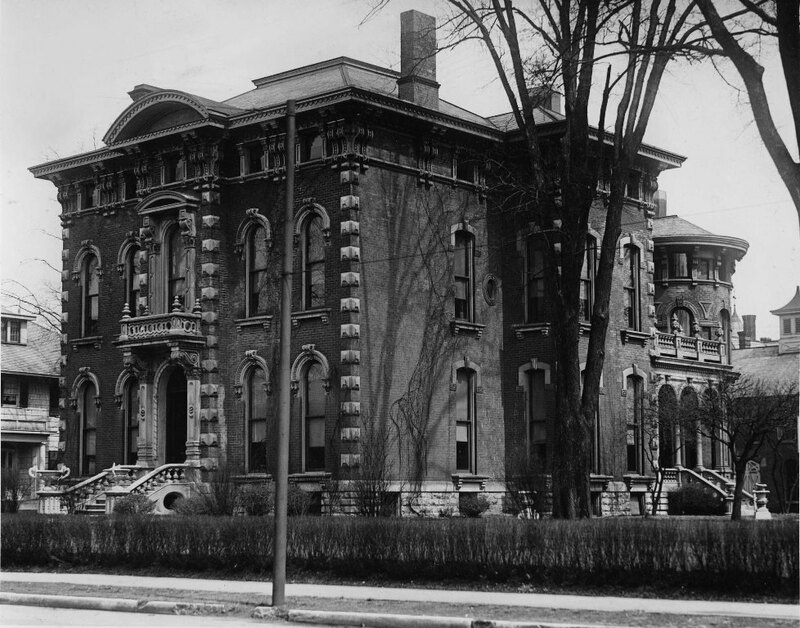 He built and even grander multi-level mansion on the river in what is now the 82nd-Keystone area, back on River Rd (I think.) I remember going to parties there, he had a 2-way fireplace linking the inside bar (with antique soda fountain re-purposed to pour gin and scotch instead of soft drinks). You could get wet inside or out. One of the bedrooms had huge bed covered with genuine fur bedspread, not mink as some said, perhaps zebra–leopard–somewhere I have a photo. Harley had a daughter Evie who must still be around who would perhaps have history of wonderful LaRue’s and Harley. Three years later, Donna but you are right. I do remember my Aunt Kit talking about Harley Horton. Another name see mentioned was Ducky Love who I believe ran around with the same crowd. I think he was a used car dealer. 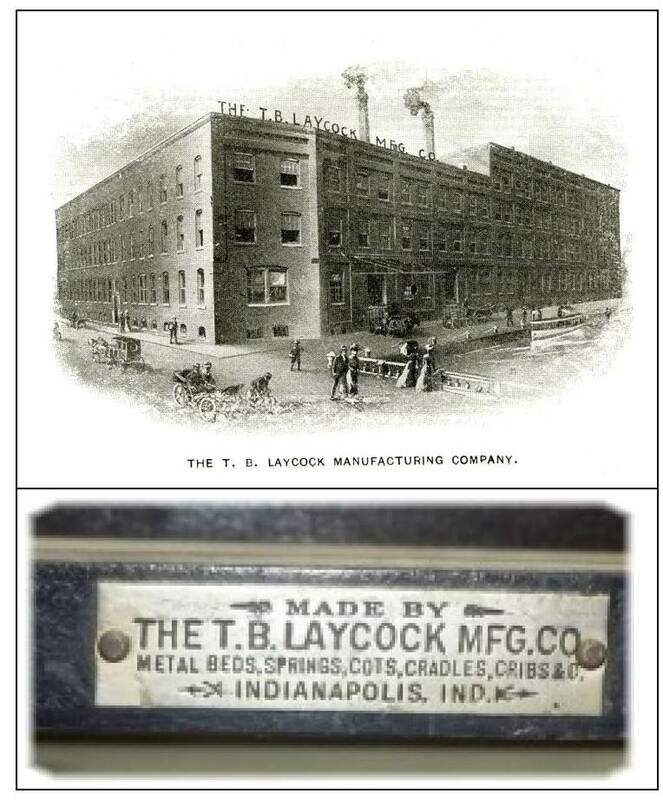 This was a truly fascinating read about a name entrenched in the history of Indianapolis. It’s too bad that the home of Albert Fletcher was buried in concrete but I am happy to see that the home of Calvin Fletcher’s grandson of the same name is finally getting some TLC just to the south. I met Stoughton’s grandson (?) at Indiana University in 1954 when he took me to church for a friend. He was polite and very down-to-earth, driving an ancient car. I believe his name was the same as his father’s, and he eventually took over the reins of American Fletcher Bank. I can’t recall his name this morning and don’t have time to research it. (He was quite attractive of average height and looked like a real ‘man’s man, as they say— like someone who’d hang out with the guys and be good at sports.). After one of your previous related postings, I discovered he’d remained quite active in community affairs.